Background: PnPP-19 is a 19-amino-acid synthetic peptide previously described as a novel drug for the treatment of erectile dysfunction. Objective: The aim of this work was to evaluate the physicochemical properties of cationic transfersomes containing PnPP-19 and the skin permeation of free PnPP-19 and PnPP-19-loaded transfersomes. Methods: Three different liposomal preparation methods were evaluated. Cationic transfersomes contained egg phosphatidyl choline: stearylamine (9:1 w/w) and Tween 20 (84.6:15.4 lipid:Tween, w/w). Lipid concentration varied from 20 to 40 mM. We evaluated the entrapment percentage, mean diameter, zeta potential and stability at 4 °C of the formulations. The skin permeation assays were performed with abdominal human skin using Franz diffusion cell with 3 cm2 diffusion area at 32 °C and a fluorescent derivative of the peptide, containing 5-TAMRA, bound to PnPP-19 C-terminal region, where an extra lysine was inserted. Results: Our results showed variable entrapment efficiencies, from 6% to 30%, depending on the preparation method and the lipid concentration used. The reverse phase evaporation method using a total lipid concentration equal to 40 mM led to the best entrapment percentage (30.2 + 4.5%). Free PnPP-19 was able to permeate skin at a rate of 10.8 ng/cm2/h. However, PnPP-19 was specifically hydrolyzed by skin proteases, generating a fragment of 15 amino acid residues. 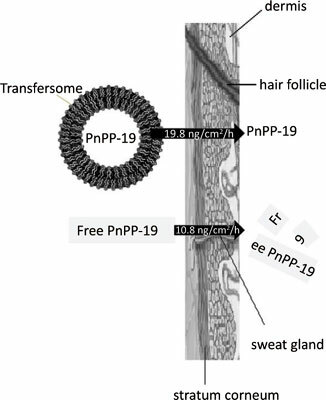 Encapsulated PnPP-19 permeated the skin at a rate of 19.8 ng/cm2/h. Conclusion: The encapsulation of PnPP-19 in cationic transfersomes protected the peptide from degradation, favoring its topical administration. Cationic transfersomes, peptide, PnPP-19, skin permeation, topical delivery system, nanotechnology.